Visual Studio Code>Other>ChocolateyNew to Visual Studio Code? Get it now. 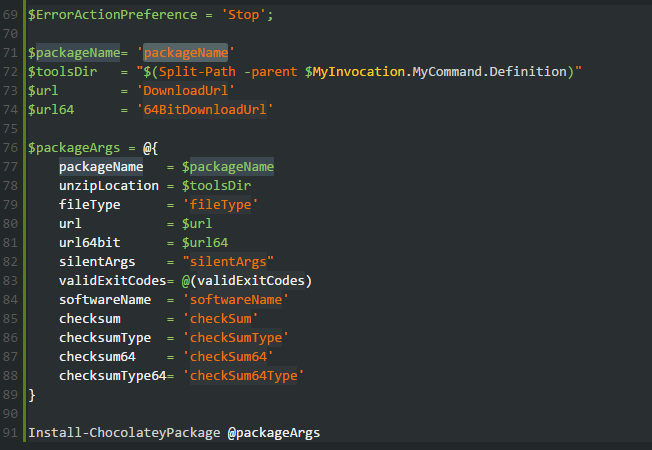 Set of snippets and commands for helping with creating packages for Chocolatey. This extension brings support for Chocolatey to Visual Studio Code. Chocolatey: Create new Chocolatey package to create the default templated Chocolatey package at the root of current workspace. PowerShell - since Chocolatey Packaging Scripts are written in PowerShell, this extension helps with the creation/maintenance of those. Zip File Explorer - to enable the ability to "view" the contents of the generated nupkg files, which are simply fancy zip files. NOTE This extension will attempt to add the necessary file association to your User Settings, so that nupkg files are treated in the same way as zip files. If you would like to see any other snippet or features added for this VS Code Extension, feel free to raise an issue, and if possible, a follow up pull request.